Get your knives sharpened, the silver polished and the whisks and roasting pans ready. Thanksgiving is almost here! 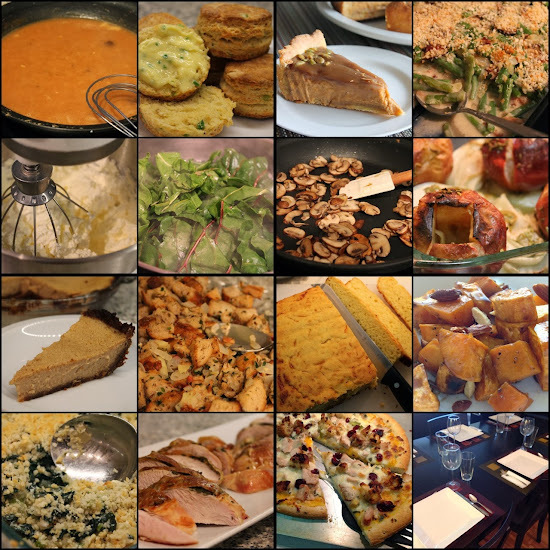 The most culinary of holidays is 27 days away--the latest that Thanksgiving can be. That means more time for talking about favorite Thanksgiving recipes. This year, I've prepared a range of dishes suitable for the novice and more advanced cook: simple favorites, updated classics and dishes with flavors from Asia and the Southwest. Plus new spins on pumpkin and apple pie. Roasted Brined Turkey Breast - After brining last year's turkey with a mix of vegetables, herbs and spices adapted from a Bon Appétit recipe, it's hard to not want to always make turkey this way, since it was so good. But brining requires quite a bit advance preparation, so this year I'll share a non-brined but still delicious simple recipe for roasted turkey breast. Roasted Parsnip and Quinoa Salad with Pistachios, Dried Cranberries and Lemon-Shallot Vinaigrette - This original recipe pairs grain-of-the-moment, quinoa, with an under-appreciated root vegetable. I have another great grain salad this year. Green Beans with Bacon, Blue Cheese, Pecans and Dried Cranberries - Greens beans with blue cheese, bacon and nuts are a classic Thanksgiving combination that I've made many times throughout the years. This year I tackle another green bean classic: the green bean casserole, but updated with fresher, more vibrant ingredients. Honey-Ginger Glazed Carrots - Carrots add a swath of color to the Thanksgiving table, especially if you use multiple colors, as in this recipe. Apple, Manchego and Pecan Salad - Inspired by a dish from Jaleo, this simple salad adds a light pit stop to the often heavy Thanksgiving fare. Cranberry Sauce - It's so easy to open a can, but it's really not difficult to make your own, and the results are undeniably better. Apple Pie with Vodka Crust - This dish, using America's Test Kitchen's ingenious technique for perfectly flaky crust, is one of my site's all-time most popular dishes, even garnering a mention from The New York Times. This year, I'll be sharing an original apple pie that melds the flavors of apple pie with the custardy technique of pumpkin pie. Thanksgiving Leftovers Pizza - Sandwiches are the easy go-to way to repurpose leftovers, but here I use them instead as pizza toppings. You can see all of last year's recipes here. It's the most wonderful time of the year! I'm so looking forward to reading your posts this month and eating your meal on Nov. 28. Hooray! How early do you start cooking for the day? I do most of the cooking on Wednesday, and work the entire day basically. On Thanksgiving day, I'll probably start cooking around midday to have everything done by 5 or so. That way, I can actually enjoy my dinner (and guests).